In the southwestern early evening sky on Monday, November 20, the young crescent moon will be visible only 2.5 degrees to the upper right of yellowish Saturn, making a lovely sight in binoculars. It's almost time to bid a fond farewell to the showpiece of the solar system: the magnificent ringed planet Saturn. For many observers, Monday will likely bring the final opportunity to make a positive identification of the planet, as it will be in close proximity to a slender crescent moon, two days past new phase and just 5 percent illuminated. Wait until about an hour after the sun has gone down before concentrating your gaze low toward the southwest horizon. Of course, these objects are not actually right next to each other; the alignment on Monday is merely an illusion of perspective. Saturn is currently situated 1.02 billion miles (1.63 billion kilometers) from Earth. The moon, on the other hand, is more than 4,000 times closer, at 251,800 miles (405,000 km) away. Interestingly, less than a day after its moment with Saturn, the moon will arrive at apogee, its farthest point in its orbit relative to Earth. You can only see Saturn's famous rings with a telescope. You'll need an eyepiece with at least 30-power magnification. However, Saturn now appears so low in the sky once it gets sufficiently dark that our atmosphere, which appears so much more turbulent near the horizon, will likely make Saturn's image appear to "boil" or become somewhat distorted. You should really wait until you can see Saturn at a higher altitude in a dark sky to search for its rings. Unfortunately, you're going to have to wait awhile for that. 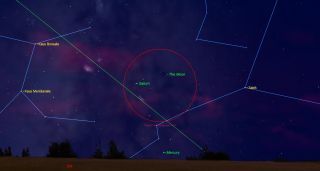 A final note: On Monday, Mercury will be hovering near the west-southwest horizon, directly below the moon and Saturn. And on Nov. 28, use binoculars to scan near the west-southwest horizon to find Mercury about 40 minutes after sunset, along with Saturn to its lower left. Mercury will glow almost twice as bright as Saturn.